Great for Smiley piercings or Scrumper Upper Lip Web piercings. Ball Closure Rings with a flat back jewelled disc which is held in place by the tension of the ring on two dimples on either side of the disc. 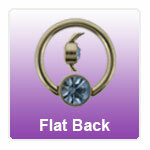 These are also great for female genital piercings and certain ear piercings. The Swarovski flat backed clip in disc held in place by 2 dimples.